In 1990, getting a break on the American music scene was a difficult task. It was so difficult, in fact, that two talented musicians living in Los Angeles, the husband-and-wife duo of Michael Glover and Robyn Rosenkrantz, took a gigantic risk by selling everything they owned except their guitars and purchased one-way tickets to Europe. Within a couple years, they'd snagged their record deal and well on their way to living lives that many of us dream about but never quite have the balls to actually act on that dream. Since then, they've toured all over the world while making and selling beautiful music together. 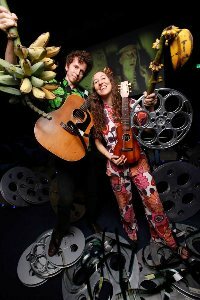 Michael Glover and Robyn Rosenkrantz, who perform and produce entertainment together under the name Bright Blue Gorilla, are headed to Indianapolis over the coming week with their film "Go with Le Flo," an official selection of the 2013 Heartland Film Festival. The duo recently took some time out from packing for the trip to talk to The Independent Critic about their whimsical and spirited romantic comedy. So, you're still out on the West Coast? You just wrapped up an appearance at the Carmel Art & Film Festival? Yeah. We leave tomorrow for the Heartland Film Festival. We just got back from the Carmel Art & Film Festival on late Sunday night. We've had a couple days to unpack from Carmel and now it's off to the next one! It's fun! That gives us a terrific place to start. Your film seems to be very well received. You've played in several film festivals already. Yes! We're very happy, especially with the audience response. That's what really matters to us more than awards or anything. You can't fool the audience. You've got a room full of people and it's just beautiful. We're very happy with the way the movie is playing live. I've obviously seen the film, but for the people who will be reading this can you describe Go with Le Flo? 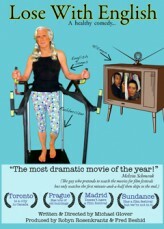 It's a romantic comedy in German and French with English subtitles. It's about Florian, who is half-French and half-German. He tends to fall for French girls and he falls for a French girl. His best friend is a German girl who loves him, but she's never said it to him. She silently suffers watching him make a fool of himself. That's the basics of the story. Florian runs a shop in Berlin called Le Flo and there's actually a shop in Berlin called Le Flo. It's exactly like it looks in the movie. If you go to Berlin, you can go there and it looks exactly like the store in the film. The owner is actually a Florian, which was a nice coincidence. Were you familiar with the Heartland Film Festival? We haven't been to it before, but we'd heard of it. It's one of those festivals that's talked about as being a quality festival. We really found out more about it from WIthoutabox. You're probably familiar with it. There are film festivals from all over the world on the website. The cool thing about Withoutabox is that you get all these e-mails in your inbox everyday telling you about the festivals and what they're for and you can submit online. It's really cool. I think that's how I really originally learned about Heartland. I looked at the e-mail and I said "Wow! This sounds like a really great festival and I'm going to contact them." One of the things I always look for when I'm watching a film, especially a Heartland film is "What makes this a Heartland film?" I've certainly got my opinions with this film, but I'm wondering what made you look at that Heartland description and think to yourself "Go with Le Flo is a Heartland film?" It's really a fantastic thing that you were selected for this festival. There were a lot entries! I'm not quite sure I want to use the word "elite," but Heartland really does look for a certain kind of film and they looked at your film and said "Yep, that's a Heartland film." Well, quite frankly, we went to the Salami Growers of the Midwest (laughing) and we asked them to put in a good word at Heartland. Who knows? We found this festival. We applied. We submitted. Thank goodness they picked it. I don't know what the criteria is, but the kind of films that we make are the kind of films that I prefer to watch - a 1930's or 1940's style sort of a moral tale. There's no profanity or overt violence in our films. There's some action, but it's that 1940's style of action. I like the kind of films that if a child walks in the room nobody has to move or pause it or worry about it. What would Ernst Lubitch do? What would Billy Wilder do? Or maybe my favorite director Howard Hawks. Our goal is really to have people feeling better when they walk out than when they walked in. Open your heart. Open your mind. Anything is possible. Our films tend to screen in arthouse cinemas and we try to attend a lot of the screenings and watch the audience. As a filmmaker, that's really how you learn about filmmaking is by watching how the audience responds to your film or responds to any film. The audience really tells you what you need to know. Especially with comedy. There's some drama in our film, but it's really a romantic comedy and with comedy you can really tell from the audience's response whether it's about a joke or timing or whatever. Fortunately, with this film we're getting terrific response. I wanted a foreign film for an American audience. It's written from an American sensibility. So far, it's been great. We look forward to seeing how it goes in Heartland. I hope it goes really well. I'm really anxious to see how Heartland audiences respond to it. I tend to go to a lot of the Heartland screenings for a lot of the same reasons you've mentioned but also from a critical perspective I think it's valuable to see how an audience responds to a film. I do plan to see your film on the big screen. That was one of my first thoughts after watching the film. I thought "I really want to see this on the big screen." I will tell you that Heartland tend to do quite well. It's a very popular film festival here with a loyal following that enjoys taking risks. They've really learned to trust Heartland's instincts about "Heartland films." Really? That's great. That's good to hear. You don't always know what to expect, especially when you're going somewhere where you don't really know anybody. (pause) That really was another thing I thought about when I was reading about Heartland. I saw that it was in its 22nd year. I thought about that word "Heart" and they've really put care into everything they've done ... even the e-mails back and forth. They've just taken great care of us. It's not that way at every festival. A lot of festivals are really unorganized and they don't even answer your e-mails for weeks. You never know. All the way around I'm thinking "This is a top notch festival," even the way they've got their schedule online and everything. We're so grateful to be a part of it. I'll be anxious to hear how your experience is at the end. How long are you going to be in town? We're going to be there for the entire festival. We're showing our movie four times and we're going to be at each screening. We're going to do a concert before each screening and, of course, a Q&A with the audience after the screenings. Of course, we want to go to other events and meet other filmmakers and see their work and meet other film people. I was watching an interview with Tim Irwin and he was talking about how a lot of filmmakers from New York and L.A. say "I want to get out as fast as I can," but then they get here and they say "I want to stay." That inspired me. You know, we get a few celebrities each year - especially opening night or closing night. I have to tell you, though, that the Heartland crowd is truly a filmmaker friendly crowd. I mean, they're human and people love meeting with and mingling with celebrities but the Heartland crowds really do love filmmakers and they love sticking around for Q&As and they're truly into the craft of film and the power of film. We are a filmmaker festival. I really hope you enjoy it. I believe that they will enjoy your film and I think that they will want to talk to you about it. They also love the folks who really stick around for the entire festival. Well, great. I'm sure we will. It's really a lot of fun sharing it all. It's fun sharing the experience of making the film. I really like that part of it. Okay, I obviously have to ask you about Bright Blue Gorilla. (Writer's Confession - I inadvertently kept calling it "Big Blue Gorilla." I even did this in my review and had to go back and edit. Quite graciously, they never called me out!) I looked at the website for Bright Blue Gorilla and it's all very consistent with the theme and the tone and even the vibe of the film. This really, I think, points out a key thing I liked about the film and that was the authenticity. You kind of lived out this idea of taking a risk. I consider myself a risk-taker and I really can't imagine doing what you did - basically selling what everything you owned and buying one-way tickets to Europe and just going for it. You haven't been through the Los Angeles record deal scene of the 80's. At that time, the late 80's, it was a mess. It was all showcase work. No real musician that I knew of was really making it on the scene except in the bars. We both were involved in that. We both said "Why are we sitting around trying to get discovered? Why don't we just go on tour?" Then, we said "Where do want to do that?" We said "Let's go to Europe." We heard that some other famous people had gone there. We sold everything we had, which was not very much but it was enough to get over there. Right away, we started playing in little cafes. Within two years of landing over there, we had a deal with Virgin Records based on a demo tape that a studio owner gave us because he took pity on us because our demo was so awful. He said "Your tape is terrible and you guys are really good." He said "Come to my studio for free on a Sunday and I'll record four songs for you." We sent it off and got a deal with Virgin. We were showing up to a packed house, getting paid and having a great time. That was really what got us going. It's been an amazing journey. We've played in cafes and pubs and always have had the greatest experiences. We were in this one cafe and we'd put our tapes on our table like we always do and our server looked at them and said "Is this you?" and they put them on in the restaurant we were in. The owner knew the person who ran a festival and that's how we got into our first festival. It was just magical. There are people out there who are just very open and they want to see the success of the arts and the artists. It has been like that for almost 25 years now that we've been traveling around. We find people all around who want to help. There's just people everywhere you go. There's been some change over there, but not everything. There's still a lot of people who really want to keep things stable. The thing over there, especially after the war, is that they want everything to be stable. They want everyone to be stable and okay. There's a lot of dynamics, but it's more stable over there and people are not as destitute over there as they can be in the West. That was our experience. It's a very good environment for the arts. So, explain this to me. Do you come back to the States? Your film is obviously playing in American festivals. It certainly doesn't sound like you've abandoned America at all. We would always come back between tours. We'd be over there sometimes for 10 months. We would always come home. We've never really set our space there. We'd find a place and stay there for awhile or rent an apartment or someone's house. My question is always "How long do you have to be somewhere before you "live" somewhere?" We're usually in travel mode and always in project mode. It's a lifestyle. How did you make the transition from music to film? That sort of snuck up on us. I was always writing things. I was writing short stories that turned into plays. I won the Eugene O'Neill Play Contest years back. That was an interesting thing. After that, I entered some different festivals with other plays. They won. I won four play contests, I think. I thought "Since I must be pretty good at playwriting, why don't I try screenwriting?" At the same time, I was working at MTV here in L.A. for about a year on The Osbournes and a show with Jessica Simpson where I was on the editing staff. So, I knew how to edit. So, there's editing I've got and I've got screenwriting. I was already a director for certain things like theater and voiceover. So, we thought we'd put it all together with our actor friends. Michael and I just said "Let's go back to L.A. and try some things. Let's do our music. Let's try acting. Let's stay in L.A. for awhile." We didn't know what was going to come of it. Then, what was amazing was that we'd gone into a casting agency for a background job and the head of the agency was friends with Matthew Broderick. Michael and I both got a call. They had no idea that we were married, because we've got different last names. They said "The director wants to meet you over at Disney." We thought "That's unusual. A director wanting to meet someone for background." We went over to Disney and Jeff Nathanson, the director, walked around everybody and we started talking and are like "Yeah, we're a band. We've been traveling around Europe." The assistant director said "We've been looking for a pair of musicians. Can you come back tomorrow and audition?" We're like "Sure!" We ended up going back the next day and playing a song. They called us and said "We want you to be in the movie" (Critic's Note - The film was 2004's "The Last Shot" starring Matthew Broderick, Alec Baldwin, and Toni Collette). We ended up being principals. We weren't background. It was six weeks. We sang a bunch of songs in the movie. We had a scene with Alec Baldwin and Matthew Broderick. It was a super Hollywood experience. Yeah, we had a trailer. These films are also paid well. So, we were able to buy some equipment of our own for making films. We actually bought our first camera from that. That's what got us started. Now, we use the artists collective model. We've not really played in major cinemas or had major distribution. We've filmed in people's houses and really just done everything ourselves as sort of an underground arthouse thing. Because we have a reputation as artists, particularly in Europe, it's really not hard to get people who will join us. Why stop now? Keep on Reading! Seriously! We're not done yet!